Here's an interesting simulation from Toyota University. Having been in the "lean business" since before the term lean was coined, Toyota has developed all kinds of lean or TPS simulations over the years for internal training. Occasionally the "Toyota University" is opened up to outsiders, but mostly this is an in-house training centre used by Toyota and their suppliers. This video shows one of the lean training simulations developed by the experts at Toyota. As you can see, the game uses toy car manufacturing (what a surprise!) to illustrate pull production. Different coloured kanban locations show which type of car is required. You can see the last guy with the stop watch taking a car at specific intervals from the coloured locations. He is the customer. When the car is taken, the coloured spot is replenished with a car from upstream. This triggers the fabricators to build another one of that colour. A classic kanban set-up! Has anyone had any experience playing this particular game? Has anyone "graduated" from Toyota University? Add your opinion to the comments below! 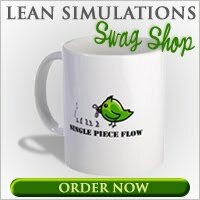 I've added this video to my list of lean games and simulations! I played this game in 2010 at the Toyota Dealer Development Centre in the Netherlands. After that we bought it through them and I am now using it as a training tool for our employees and partners at Heembouw (construction company). Can you tell me where you purchased the game? Thanks for the comment Rudy. I didn't know that Toyota used it to train their dealers, but I guess it makes sense. Must be fun to play with the little cars! I am a trained teacher in this game. It is however a short/quick game and the pupils are not really invited to participate with suggestions, improvements etc. As a simulation it works really well but as TPS/Lean training Toyota has better education tools. Nice to hear from someone that knows about this game. With those fancy cars, I expected more of an interactive game. Although even a short simulation is nice for demonstrating lean processes. Thanks! Looks like there is still some improvement possible on load balancing or Skills ;) The lady last in the production line is slowing down. Rebalancing is definitely worthwhile here, or perhaps they could reallocate an operator and run with two. Depends how often the customer wants a car. A dashing wheel is one of the gaming fringe which is utilized in the hustling computer game.https://unblockedgamesboo.weebly.com It gives the solace to the players in their development abilities of playing game. The presentation to these https://unblocked-games-for-school.com/ fierce games additionally expanded the forceful contemplations and feelings of the kids for the time being. This circumstance has incited organizations that are assembling and showcasing the two sorts of gadgets to concoct highlights that will separate them from contenders or potentially draw in more clients. These schools would have more noteworthy ENGINEERING MUT self-rule and an advancement program would be instituted by Principals. Hiya, I am really glad I have found this information. Nowadays bloggers publish just about gossips and web and this is actually annoying. A good site with exciting content, that’s what I need. Thanks for keeping this web-site, I’ll be visiting it. Do you do newsletters? Cant find it read the full info here. When you go on the web or to a retailer and you filter through the best gaming headsets, find out here now you're going to find that there are a great deal of alternatives. So what are you waiting for, unblocked games just click and play latest games and experience the gaming life. I really thank you for the valuable info on this great subject and look forward to more great posts. Thanks a lot for enjoying this beauty article with me. gt aloha I am appreciating it very much! Looking forward to another great article. Good luck to the author! All the best! Gaming PCs by their very nature produce a ton of warmth, unblocked clicker heroes particularly when they are put to the maximum with extraordinary amusement playing.